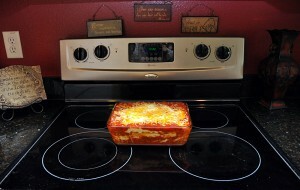 Tonight I made my husband a delicious lasagna for dinner for his birthday. I made it using lower fat ingredients so it would be somewhat healthy. I like to use the lean meat with my sauce. I am not a big meat fan and could do without it but it was my wonderful husband’s birthday. I also use the low fat cheese. I have no idea what the fat or calories are but I’m sure it’s better than the regular version. He sure did enjoy it and we have tons leftover for tomorrow! Yeah, no cooking for me! Tonight I met up with a friend that I haven’t seen in a long time. She is going to run the marathon in January! Way to go Tina! I’m excited that I will know at least one person that is running the course. We went for a six mile walk/run tonight. It was relaxing and fun to touch base and reconnect. Running is always more fun when you have someone going with you. I love running through Walden Lake. it’s a nice 6 mile run from my house. The lake is beautiful to look at at sunset. Tonight we started later and ended up getting back home in the dark. My husband even came out to take some pictures. He got a new flash for his camera and thought he would try it out. Honestly, I look terrible in pictures. I didn’t even take my senior pictures in high school! Women can be so critical of themselves. Trust me, today I even had a fourth grader tell me “Mrs. Stevens, your getting fatter and fatter! And look at those legs, they are so big!” For real just today I was told that! I think tomorrow for reading I should pull some books that teach about manners and kindness.So when I look at my pictures from tonight, all I see is big legs! Hey, I am pear shaped and that is how God created me. I can’t change that.